Social Lens Research announces the launch of participant recruitment for The Impact of Mobile Technology on Hispanic Businesses Study. The study is being conducted for Mobile Future, in partnership with the US Hispanic Chamber of Commerce (USHCC) and Latinos in Tech Innovation and Social Media (LATISM) who will be critical to recruiting Hispanic Businesses. The study will focus on better understanding if and how Hispanic Business owners are using mobile to manage and grow their businesses. which specific business activities are being conducted on mobile? are Hispanic business owners invested in making their businesses mobile? 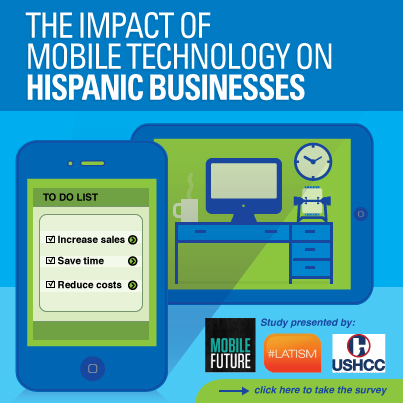 what is the economic impact of mobile on Hispanic business (e.g. new business, increased productivity)? what is needed to help more Hispanic business owners take advantage of the mobile economy? Please take the quick survey here. As a small thank you, study participants will get first access to the study results! Thanks for the help with the study! Mobile Future (MobileFuture.org) is a coalition of cutting-edge technology and communications companies and a diverse group of non-profit organizations, working to support an environment which encourages investment and innovation in the dynamic wireless sector. US Hispanic Chamber of Commerce (#USHCC) The USHCC is the leading advocate and resource for Hispanic businesses in the global market. Representing over 3.2 million U.S. Hispanic businesses, contributing in excess of $468 billion to the American economy each year. Latinos in Tech Innovation and Social Media (#LATISM) is a nonprofit, nonpartisan organization dedicated to empowering Latino(a)s in the areas of education, health, technology & business through the use of tech innovation & social media.